News Assets of the Tool Steel Division of Steel Warehouse Company, LLC Sold to Cincinnati Tool Steel Company Inc.
Assets of the Tool Steel Division of Steel Warehouse Company, LLC Sold to Cincinnati Tool Steel Company Inc.
InterOcean Advisors LLC (“InterOcean”) announced today that certain assets of the Tool Steel Division of Steel Warehouse Company, LLC have been acquired by Cincinnati Tool Steel Company Inc., a value-added distributor of tool steel, powder metal and alloys based in Rockford, Illinois. 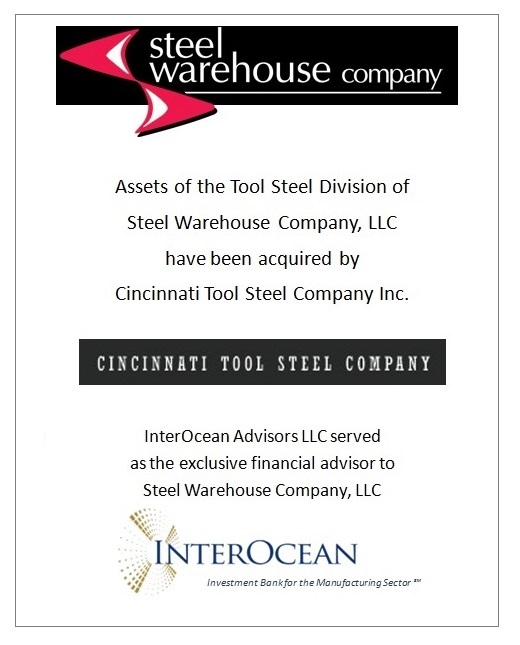 InterOcean served as the exclusive financial advisor to Steel Warehouse Company, LLC (“Steel Warehouse”). The Tool Steel Division of Steel Warehouse operated as a master distributor of multiple tool steel products. Processing capabilities included sawing, milling and grinding. The Division was headquartered in South Bend, Indiana. Steel Warehouse is one of the largest family-owned industrial networks in the U.S. and Mexico focused in the metal service center sector. The company offers a broad range of processing services to provide production-ready steel for metal stampers, fabricators and manufacturers. Services include leveling, slitting, temper/cut-to-length, blanking/shearing, pickling and cold reduction. Steel Warehouse affiliates produce mechanical and structural grade steel tubing and fabricate medium to heavy gauge components for original equipment manufacturers.